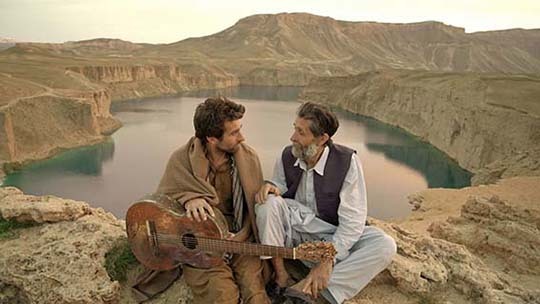 Benjamin Gilmour, a very enterprising Australian filmmaker, has just released Jirga, a film not just set in Afghanistan, but actually made there. Mike Wheeler, an Australian soldier stationed in Afghanistan, took part in a raid on a village in the Kandahar area of southern Afghanistan. In the attack he realizes almost instantly that he’s shot and killed an innocent villager and it has preyed on his mind ever since. Now he comes back to Afghanistan, toting a large number of US dollar bills wrapped in plastic film around his waist. He intends to go back to the village and make amends to the victim’s wife and children. That doesn’t prove to be easy to do, starting with the driver he recruits in Kabul who definitely isn’t interested in a little trip to one of the most unsafe regions of the country. ‘So how far south can I go?’ he asks his hotel manager and the answer is ‘Bamiyan.’ Which is a little strange since Bamiyan is north of Kabul, not south. 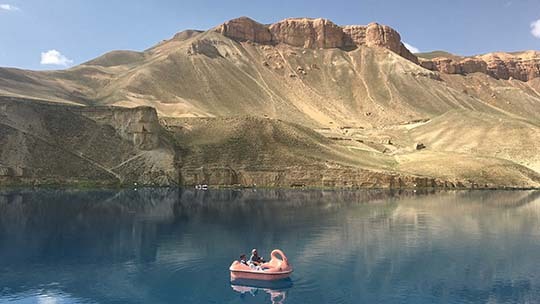 ▲ Never mind there’s a nice scene of Mike strumming on the guitar he’s just bought in Kabul while he and the driver sit above the stunning lake of Band-e-Haibat, one of the lakes in the Band-e-Amir park near Bamiyan. 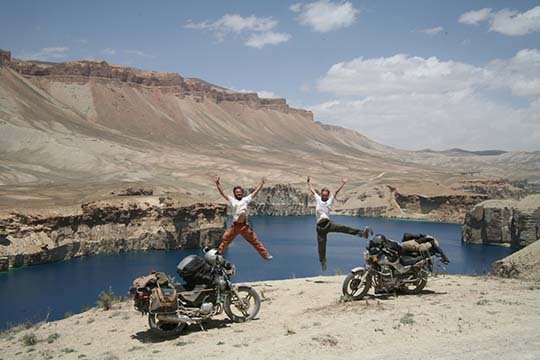 ▲ Remarkably when I visited Band-e-Amir and Bamiyan in 2006 to write my book Bad Lands I met these two French motorcyclists – they’d ridden from Cambodia and were on their way to Europe – and photographed them at pretty much the same spot. 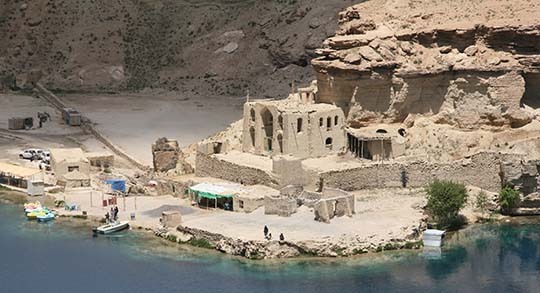 ▲ I took this photograph of the lakeside settlement at Band-e-Haibat on my 2006 visit and what’s that over at the left side of the photograph? 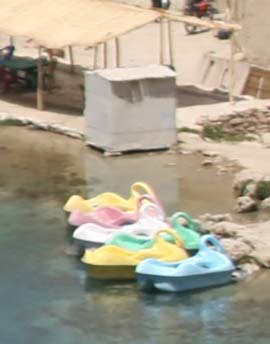 ◄ Yes, it’s a little group of pedal-boats – including the pink one – waiting to be hired by Afghan day trippers. From Band-e-Amir Mike does persuade his driver to take him south towards Kandahar, but then there’s a Taliban ambush, he ends up captured and eventually makes it to the village where the raid went down, finds the house where he killed the innocent villager and finally it’s down to a Jirga – traditional village trial – to decide whether Mike lives or dies. The victim’s eldest son has the right to choose between revenge or forgiveness. In the final scene we see Mike – still alive – in a nicely overloaded local bus heading back north (we presume) towards Kabul. Now why didn’t he just jump in a bus in the first place? Never mind it’s a brave piece of film making and a very pleasant change from the usual movie storyline where the western hero races in and shoots the hell out of villainous Taliban, Mujahedin or any other wicked terrorists who get in his way.